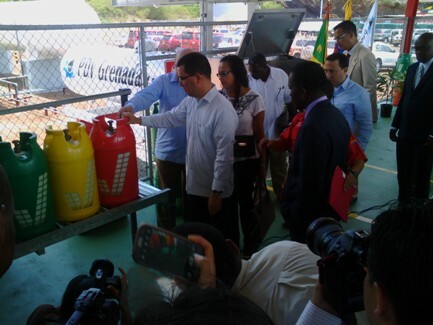 PetroCaribe Grenada will officially launch its LPG product to the market on Tuesday, 26 April 2016, sold at EC$37 for the 20 lb cylinder. It will not be offering 100 lb cylinders. The cylinder deposit will be $50, regulator and hose will be $15. “A first time customer will pay $102,” said Ambrose Obike, Chairman of PetroCaribe, who explained that the bottles are made from fibreglass, and one of its main benefits is that it will not explode in a fire house fire but instead collapse with the heat. Vulnerable homes and community will be the initial target for users, and the company is expected to embark on a vigorous marketing campaign aimed at attracting customers of LPG to switch from their traditional suppliers. PetroCaribe was established by an agreement with Venezuela aimed at producing cheaper gas to the region. There are already 2 LPG suppliers on the market which are regulated by Government. Grenadians presently pay $42 for a 20 lb cylinder from the 2 traditional suppliers. The plant producing the gas is named after former Venezuela president Hugo Chávez, and was completed on Wednesday, 15 July 2015. It was visited by President Nicolás Maduro in October 2015.